Oh yeah! Come on, you know you want some! But all that OIL you say….all that FAT you say…. These babies are 100% completely oil free. And crunchy? I wish you could have heard me chowing down on some when I was taking the pictures. I think my wife had to turn the TV up a bit….. The secret my friends is in the breading. So let’s quit stalling and get right to it. This will take a wee bit of time, but I can assure you, they are well worth it. 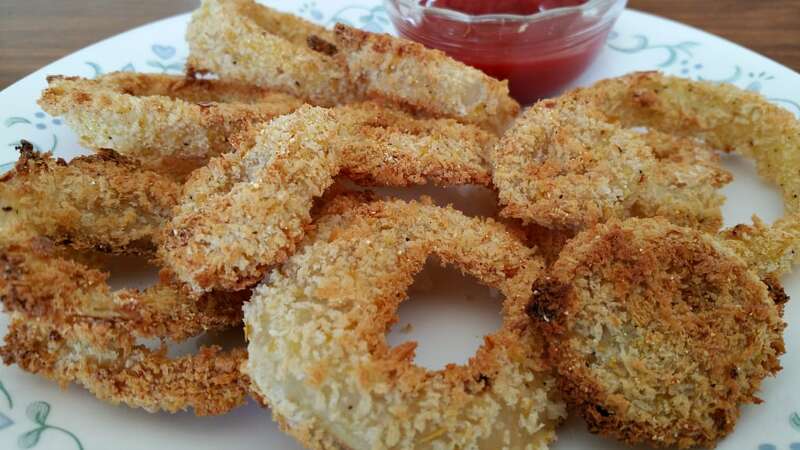 I searched the net and studied about a dozen Onion Ring recipes, both deep fried and baked, and used what I thought were the best parts of all of them to come up with this recipe. All the recipes that had the highest reviews, had 3 things in common. A buttermilk soak, a thick, rich batter, and a breadcrumb coating. But first of all, make sure you start with a nice big Walla Walla Sweet or Vidalia Onion. Big, Yellow, and Sweet. That’s what we want. And when you slice them, make they’re sliced thick, like 1/2″ or more. Next, a buttermilk soak seems to be a necessary step. It chemically does something magical to the onion that makes us unable to stop eating them. I’m serious! My plate is gone already! But we can’t have buttermilk because we’re vegan? Right you are, but we can add some apple cider vinegar to almond milk, and bam – instant vegan buttermilk. Soak your slices in this magical elixir for at least 1 hour – but longer is better. When you’re through soaking, you’re going to use that same buttermilk to make the batter, so don’t pour it out! The flour and cornstarch makes a nice, thick, pancakey (yeah that’s my word ) batter – perfect for dipping those rings into. And then comes the magic part. I’ve seen recipes that used corn meal, mashed potatoes, and even potato chips….. but all the BEST recipes used Panko. So make sure you can find some. My local Fred Mayer had them so any big box grocery store should carry them. Add in some super secret seasonings and the assembly line is complete. A quick dip in the batter, a little roll in the breading, and onto a cookie sheet we go. I used parchment paper to make cleanup a breeze. Bake these little babies for about 20 minutes on 425 degrees, and then turn them over for another 5-10. Now quick – grab the ketchup and hide because everyone is going to want some! Crispy, crunchy, baked onion rings without all the grease and fat. The almond milk 'buttermilk' makes an excellent batter and seasoned panko breadcrumbs make the crunchy coating. You're going to want to give these babies a try! After soaking, pour off 1 cup of the 'buttermilk' and mix with flour and cornstarch to make a batter. Dip each onion in batter and shake off excess. Bake in preheated oven for 20 minutes at 425 degrees. Flip rings and bake an additional 10 minutes. OR....Air Fry for 10-15 minutes at 350. I just made them and they are delicious! The only thing I am not a fan of is the slight taste of Almond milk that remains. It’s not a big deal because there are onion rings on my plate that are crispy and yummy and ketchup covers the taste! I may try a different type of milk next time. Wow these look so yummy.. I used cashew milk with great results. I think this batter/breading technique is great for oven-baked anything. I used the recipe to make oven-baked zucchini sticks and they were wonderful! Next, I’m going to use this batter/breading technique on eggplant slices to make eggplant lasagna or perhaps an eggplant parm-less. Hey, now, there’s an idea for a recipe! Eggplant parm-less! I made these but made some alterations such as using chickpea flour and using flax meal instead of panko crumbs lastly water instead of milk. I enjoyed them and I am not a dip lover. Can anyone clue me in on what almond milk, or any other nut or bean milk, does that milk also does, that water doesn’t do on its own? I’ve yet to find a recipe I couldn’t just use water in place of milk and flax meal in place of eggs, but am I missing something? Oh my heaven,, these onion rings are ‘DA BOMB’!!! My daughters and I were making so much crunching noise eating these I’m surprised my neighbors didn’t complain!! LOL I love onion rings and cannot find an oil free brand in the supermarkets in my area so thank you a million times over again for this recipe, Chuck! Made these tonight and they were fabulous! Very flavorful and very crispy! I baked them on silicone mats in my convection oven. I made these tonight. They are great. Crispy an very tasty.